It’s Spring Break and school is out! Now what do you do with the entire family with the least amount of complaints? Tampa Bay parents are asking this very same question. 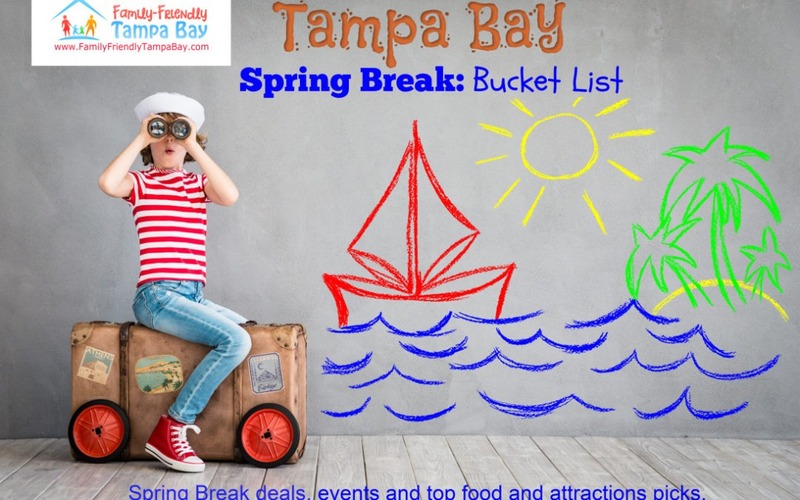 Thankfully, we’ve come up with our Spring Break bucket list of fun things to do around Tampa Bay for the ENTIRE family. If you have a combination of young children, tweens or teenagers, we think this list will satisfy (OK, mostly) even the pickiest family member. While we have some great attractions like Busch Gardens, play zones and others. What about those natural attractions that are unique to our area? 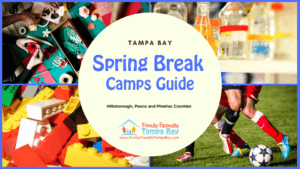 We have come up with some of our top picks for fun and affordable options that helps your family to explore the natural beauty of the Tampa Bay Area. 1. Most U-Pick Strawberry Farms are open for the season. With prices as low as $2 a lb for organic strawberries, it’s definitely worth the trip. 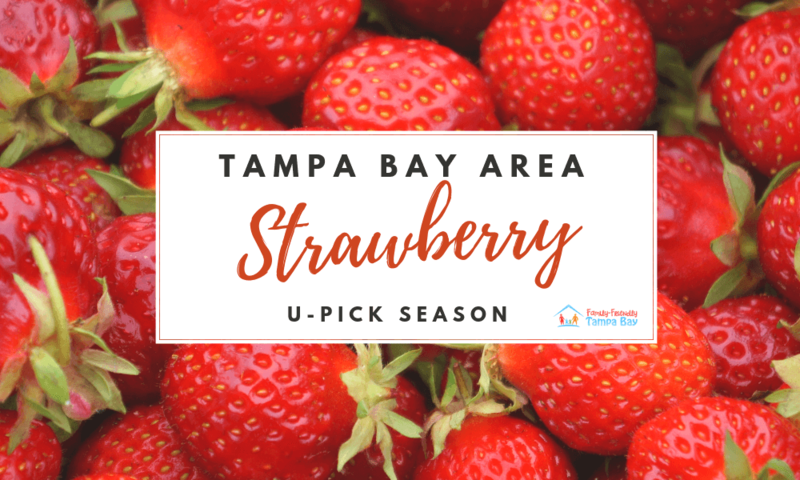 Check out our Tampa Bay list of U-Pick Strawberry farms. Bonus: Stop by the Parkesdale Farm Market for some strawberry milkshake and their world famous, strawberry short cake in Plant City. You’ll thank us later;-). 2. 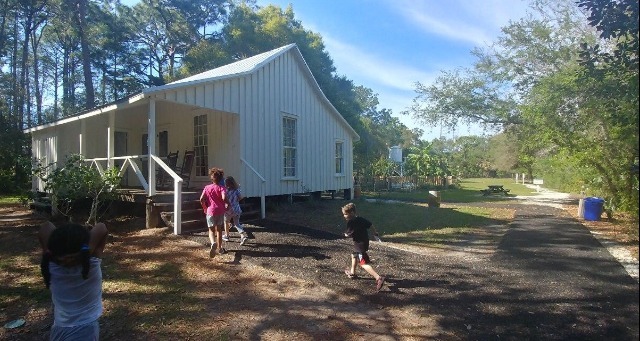 Come visit the Heritage Village, an open-air living history museum in Largo, FL from Wednesday-Sunday for free admission. See more than 31 historic buildings dating back to the 19th century. 3. 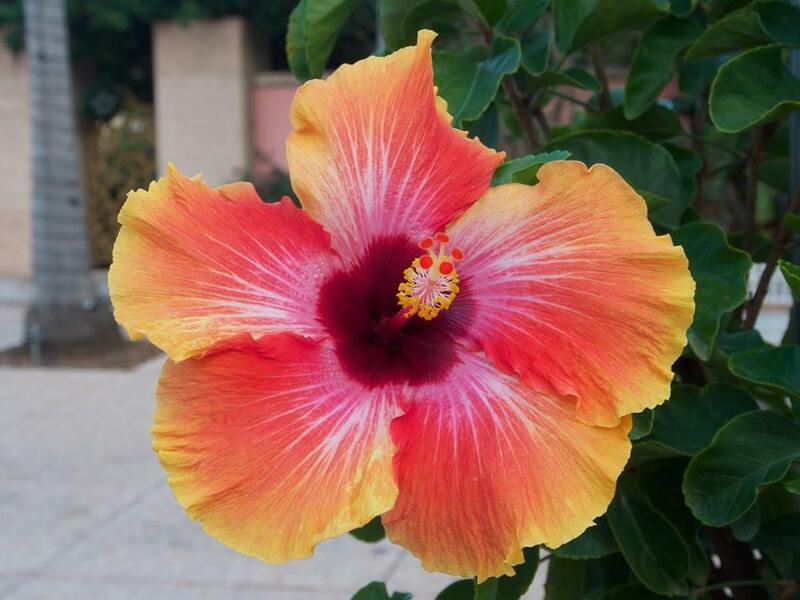 While you’re at the Heritage Village, walk over to the nearby beautiful and well kept Florida Botanical Gardens for free admission. 4. 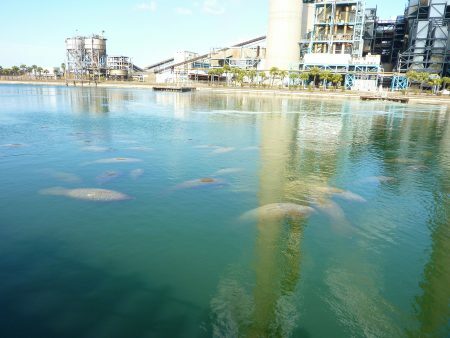 Stop by the Manatee Viewing Center for free admission before they close for the season in April. Make sure to visit the new ray tank while you’re there. After your visit with the manatees, take a short drive to the beautiful Ringling Museum. 5. 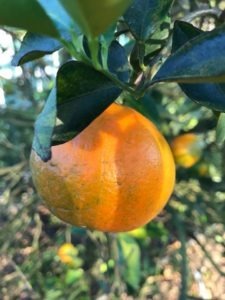 The orange is the state fruit for Florida and did you know you could pick your own orange from one of our Florida Orange Groves? We took our family and had a blast with the kids at Hancock Groves in Dade City. There is also another orange grove in Ruskin, FL at Dooley Groves. Dooley Groves: U-Pick honeybees and tangerines. Open daily from 10am-4pm. 6. An affordable family day trip is not too far away. 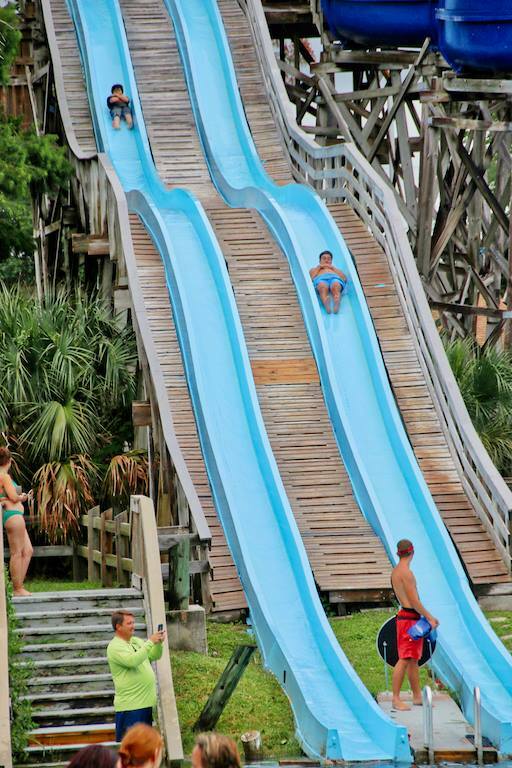 Spend the day at Buccaneer Bay at Weeki Wachee Spring State Park. Slip and slide on the waterslide in the beautiful springs. Please note that they are currently under renovations and the mermaid show, boat ride and animal encounters will not be available until April. 7. 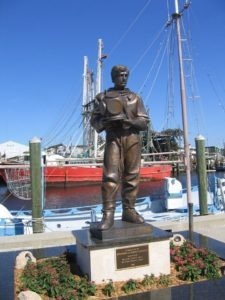 Visit the Sponge Docks in Tarpon Springs which is a leader in the world’s natural sponge market. In addition to seeing the history of sponge harvesting, visitors can take a boat ride with the family to see how the sponges were extracted in the past, you can also experience the Greek influence, Greek restaurants and shops and even visit the local aquarium and parks. Find out more here. Did you know you can visit Heartland Events all year round for family fun? While they are known for their Fall Maze and festivals, and now you can enjoy all those fun activities all year long. Visit during Spring Break for a fun day trip that will please even your pickiest family member.! Price: Ages 2 and under are FREE! Price ranges from $4.95-$12.95 + tax. Visit website for details. 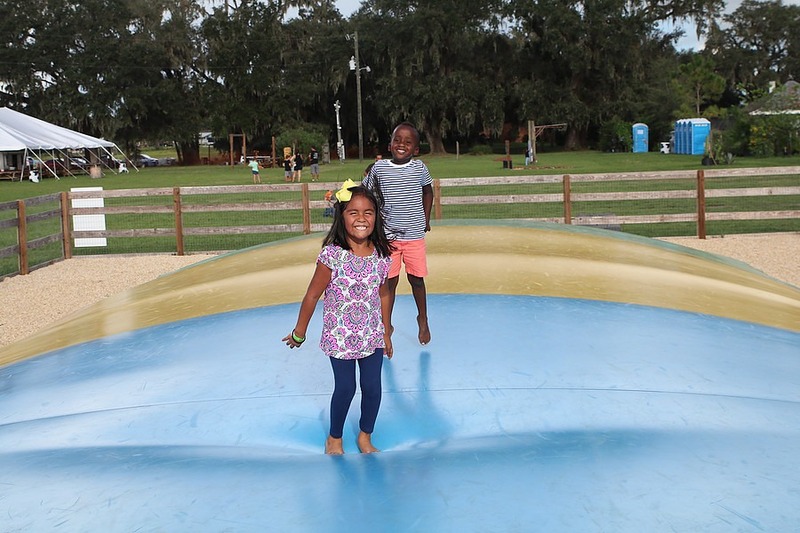 Activities include: Jumping Pillow, Pig Races, Blast Zone, Playground, animals and so much more! Visit their website for more information and details. 1. Indoor trampoline parks are perfect for children, tweens and teenagers. 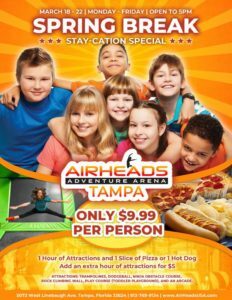 From March 18-22, 2019 at AirHeads Adventure Arena- Tampa enjoy one hour of attractions and a slice of pizza or one hot dog for only $9.99 per person. You get to jump and eat for one low price. Add an extra hour of jump time for only $5. See all dates here. 2. 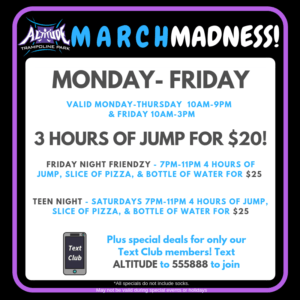 Visit Altitude Trampoline Park in March on Monday-Thursday from 10am-9pm and Friday from 10am-3pm get 3 hours of jump for only $20!! 3. The largest hockey center in the southeastern U.S. is right in our backyard. Check out the AdventHealth Center Ice in Wesley Chapel on St. Patricks Day on Sunday, March 17th. There will be ice skating, music, a raffle, prizes and more! If you wear green, you will receive a free skate rental! 4. Looking to roller skate? United Skates Tampa is constantly having deals, and spring break is no different. Check out their daily specials for the entire family that includes All You Can Eat Pizza Skates, Bounce N’ Skate, Character Skates, Glow In The Dark Skates, $1 Skates, and Family Skates!! 5. We love specials! Celebration Station in Clearwater has a great Spring Break special for unlimited play on their go-karts, bumper boats, and so much more for only $15. See all the dates. 6. 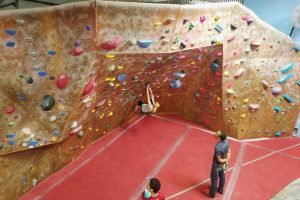 Bring the family and climb the walls at Vertical Ventures (Tampa & St. Pete)! They have a Tuesday special that offers $10 Admission for students. Tampa Location Only. You can also stop by for their 2-for-1 Admission every Saturday evening from 6pm to 10pm . 7. Dave & Busters is still new in town. Play some games and eat with the family. Check out their weekly 1/2 price off games on Wednesdays. See all upcoming dates. 8. On Mondays The Ringling Museum in Sarasota offers free admission to their Museum of Art, including special exhibition galleries. Huge playground onsite for the little ones. Regular admission pricing applies if you wish to visit the Circus Museum or Ca’d’Zan. 1. Adventure Island water park is officially open for the season. If you purchased the Busch Gardens Fun Pass that also included admission to Adventure Island, then you’re in luck. Hop between parks for a day filled with adventure. 2. Seems only fitting to make it to the beach during spring break. Thankfully there are so many to choose from and it’s an easy and cheap way to entertain the entire family. 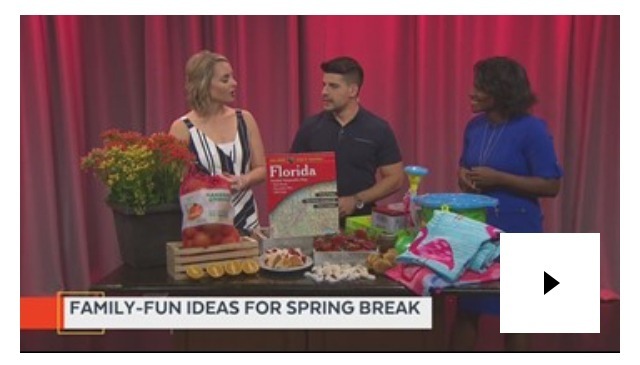 Some of our favorites include Honeymoon Island, Siesta Key and Pass-a-Grille beach. 3. Splash Pads are everywhere for the little ones. 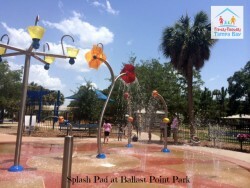 Some of our favorites include Water Works Park in Tampa, Zephyr Park in Zephyrhills, Julian B. Lane Waterfront Park and Kiwanis Sprayground Park and Ballast Point Park. 1. Kids of all ages will love to create their own masterpieces. Pottery and painting locations around Tampa is great for all ages and it makes for a great family keepsake. Plan ahead and create a Mother’s or Father’s Day gift. Many locations offer discount days on their studio fee. Find the closest pottery studio and check out their calendar for discounts/specials. 2. 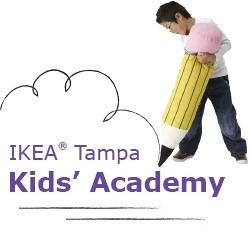 IKEA Tampa Kids Academy is in swing during Spring Break! Check out their daily schedule on our events calendar. 1. Wouldn’t it be nice if you could watch a movie and eat real food? Well you definitely can, and at these two locations you can bring the entire family. Studio Movie Grill in Tampa offers an eat-in experience while watching a movie and if you head on over to Villagio Cinemas in Carrollwood, you’ll enjoy the motorized recliners as you watch the latest blockbuster. 2. Movie Deals: $5 movies at Studio Movie Grill & AMC on Tuesdays! 3. These classic Drive-In movie theatres will bring you down memory lane and save you a few bucks off of your movie ticket for spring break. 4. Free Spring Movies Series at Goodrich Quality Theatres in Gibsonton on Fridays, Saturdays and Sunday mornings. Read more details. 1. Have you been to MOSI lately? 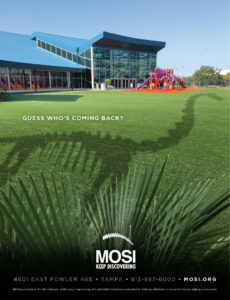 If your kids want to see a HUGE dinosaur skeleton then you can now visit MOSI daily from 10am-5pm and check out their permanent Dino Lab exhibit and learn more about the life of the Diplodocus dinosaur. Check out our calendar for details. 1. Fruit galore at Grain & Berry in Tampa. We just made a visit there and we are loving tall the tasty fruit options, get an acas bowl, a fruit parfait or even a delicious avocado toast. Make it apart of your bucket list to visit Grain & Berry in Tampa. 2. We have yet to meet a child who doesn’t love Froyo! There are so many locations and you can even find them in gas stations. Our favorite flavor is Dreamsicle from Happy Cow Frozen Yogurt. 3. A dinner and a show is what you get at Hibachi Grills across Tampa Bay. We love that Kobe has kids eat free deal on Tuesdays when you register for their rewards program. 4. Kids Eat FREE everyday of the week. Check out our master list of kids eat free and cheap days. Make sure to always call ahead to confirm. Become a fan on Facebook, Twitter, Pinterest, and Instagram for daily updates.